Dear Salty: My wife and I recently visited my grandmother and decided to take her out to a local diner nearby. My grandmother has mild dementia and can easily get confused. When dinner was over and I got up to pay the bill, my grandmother decided she would cover the tip. She got her purse and pulled out a one-dollar bill. Just then, the waitress walked by and my grandmother handed her the one-dollar bill and very happily exclaimed that she was delighted to have had her wait on our table and that the waitress “deserved ever bit of that dollar.” The waitress looked horrified and rolled her eyes, let out a very loud sigh, and walked off. This all happened before my wife and I could do anything to stop it. After we had helped my grandmother to the car, my wife and I talked about what we should do. My first reaction was to find the waitress and give her a proper tip, but my wife told me not to. She argued that the waitress didn’t deserve anything more because of her attitude. I didn’t want to argue with her, so I went along with her decision, but I felt guilty about it. I wanted to explain what happened and that we really did think she gave us excellent service. So, my question is: Was my wife right to withhold a tip due to a bad attitude over a misunderstanding or should have I gone back in and tipped more? To avoid this kind of unpleasantry in the future, it might help to give your server a heads-up that your grandmother has dementia and that she may act in unexpected ways. 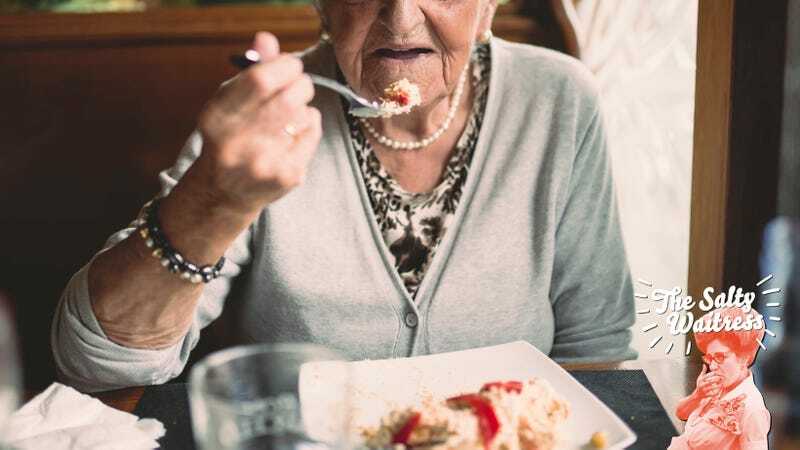 You probably don’t want to yell “She has dementia!” in front of granny, but maybe a discreet word off to the side of the table would do the trick. The Alzheimer’s Association even offers printable cards for this very purpose. The main question I have after reading your story is whether the server was aware your grandmother had memory issues. If not, I can see how the server might think she was just a mean older lady who said “you deserve every bit of this dollar” in a sarcastic way. It’s still never a great idea to roll your eyes at customers, but it’s an understandable reaction if the server thought your grandma was mocking her. My gut says that server didn’t know your grandma has dementia. If the server was pleasant and helpful during your entire experience, I find it unlikely that she’d be suddenly rude to a woman she knows has a cognitive condition. She probably just misinterpreted your grandmother’s remark and read it as a big kiss-off. I think you and your wife could have compromised on this: You could have gone back into the restaurant and tracked down the server to explain the situation. If, after hearing that your normally sweet granny has dementia, the server was still acting stuck-up and offended, then you don’t have to give her any more tip than you’re comfortable with. My instinct, though, is that the server would be apologetic and glad that you cleared up the understanding, in which case, I think you should fork over the rest of the cash.